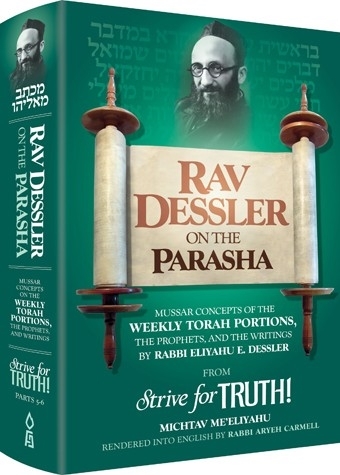 In over a thousand lectures throughout his lifetime of teaching, the renowned master of mussar, Rabbi Eliyahu Eliezer Dessler offered countless inspiring and original insights into the ethics and philosophy of Torah Judaism. His shiurim were issued posthumously in a series of five Hebrew volumes entitled Michtav Me’Eliyahu, prepared by Rabbi Aryeh Carmell, one of Rabbi Dessler’s foremost disciples in England (in collaboration with Rabbi Solomon A. Halpern of London and Rabbi Chaim Friedlander of Bnei Brak). Michtav Me’Eliyahu has become a classic of modern Torah thought, widely read and studied. Rabbi Carmell then went on to render into matchless English selected essays from the Hebrew work, which became a six-part series entitled Strive for Truth! This series which was received with resounding acclaim, introduces us to some of Rabbi Dessler’s basic ideas and penetrating insights on the confusing, bewildering world around us. The essays in this volume, comprising Parts 5 and 6 of Strive for Truth! 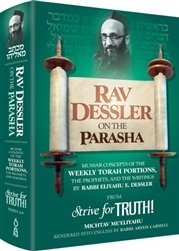 apply Rabbi Dessler’s penetrating mussar concepts to the weekly Torah portions, as well as to segments of the Book of Prophets and the Writings. Educators and students alike will delight in this unique look at the Torah. Torah MiEtzion: New Readings in Tanach -3 Vayikra Rav Levi Yitzchak of Berditchev: Stories and Thoughts Arranged According to the Weekly Parashah Genesis: the Beginning of Desire What's Beyond the Bible Text?